Looks amazing plays fantastic smooth rolling easy storage. No. 111 - Center Fold Very Strong And Sturdy Table. No. 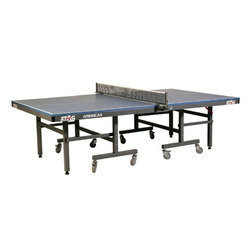 2009 - stag americas very strong and sturdy table approved by ittf. No. 112 - Family Model With Side Wheels Recommended For Inhouse Play. No. 112W - Family Weather Proof Suitable For Indoor & Outdoor Use In Home And Garden. Extra Strong Playing Surface Giving Good Playability. Legs Fold For Storage.Two Side Wheels On Each Half For Easy Movement.Ready To Play. No. 100 - Stag T.T. 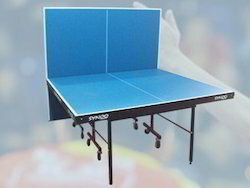 Table Recommended for National & International Competitions. 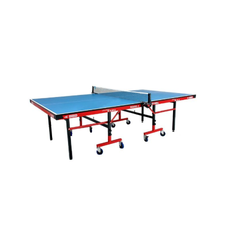 Stag Peter Karlsson Training Table is a good playable table with modern looks which will provide you comfort game and it is suitable for any playing area. 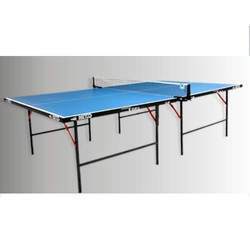 Thickness of top frame is 16mm; frame size of table tennis table is 19x29mm, this table has 2 wheels with lock and 2 wheels without lock which will provide opportunity to fix the table as per desired position with more stability. 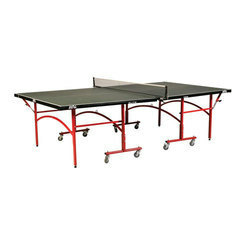 Table paint is equipped with polyurethane anti glare paint which will provide you excellent stuff to enjoy the game easily. 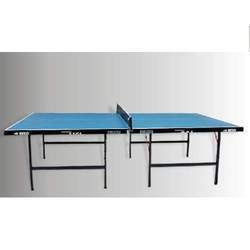 Table size is 2740x1525x760 MM and storage size of table is 162/160/65CMS. 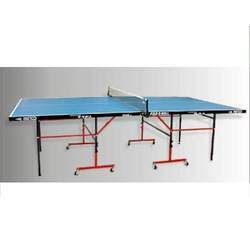 Table package size is 161/145/15 CMS, Net weight of table is 79kgs and Gross weight of table is 86kgs. 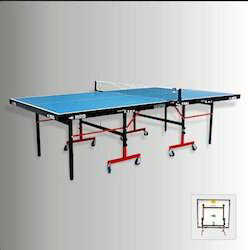 Volume of table tennis table is 0.35CBM. table assembly time is 35min. No. 2000 - Roll Away Very Strong And Sturdy Table. Back Play Possible Galvanized & Powder Coated Steel Tube Suitable For Outdoor & Indoor. No. 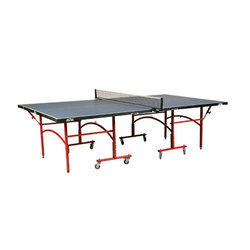 124 - sport indoor very strong and sturdy table with modern looks. No. 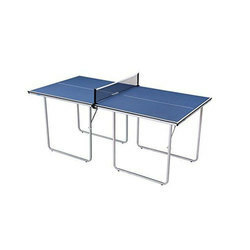 124W - Sport Outdoor Very Strong And Sturdy Table With Modern Looks. Wheels Size-100 mm with a stopper and brakes. 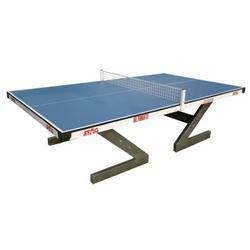 Recommended for Tournament at Club, District & State Level. FREE ACCESSORIES : NET, POSTS, CLAMP & BALLS, 2 PCS. T.T. BATS. 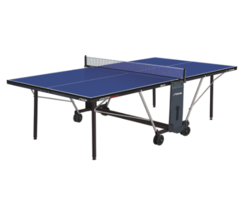 Bring home the Stag SLEEK TT Table and start playing this fast and exciting game to gain agility, improve hand-eye coordination, and achieve your fitness goals. 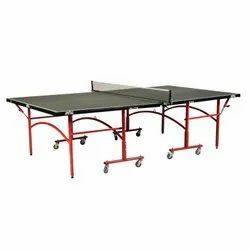 This durable and robust table tennis table features Dupont Polyurethane Anti-glare Paint coated surface, a Heavy-duty Post, and Adjustable Net to enjoy long sessions of table tennis. Very Strong and sturdy table. Back Play possible, Galvanized & powder coated steel tube suitable for outdoor & indoor. 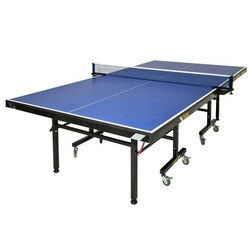 Revolutionary material for COMPREG Table Top. 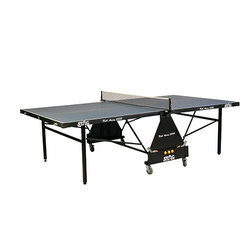 STAG is the only Indian TT Table approved by International Table Tennis Federation (ITTF). Based on pre-laminated high quality tops. Fitted with metallic pipe at borders to avoid any warping whatsoever during climatic changes. Special anti-glare Dupont coating. Faster speed and even bounce. Fitted with wheel locks to provide stability. All metallic parts are coated to avoid rust in extreme humid conditions. Child safety lock. 25mm Top Fiberboard, blue coated. I.T.T.F. Approved. 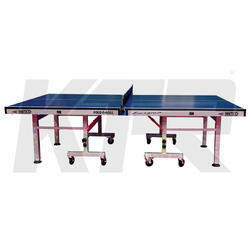 An excellent COMPETITION table, with roller trolley. This table is very stable and functional. The legs fold out automatically. 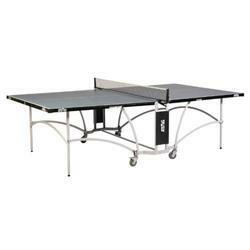 It has an extra high density top with excellent bounce. Packaging in Double cartons. Storage size: L=152.5cm, W=66.5cm, H=154cm. For INDOOR use only. No. 113W - Stag Ultimate Weather Proof The Ultimate Anti Vandalism Table For Outdoor Or Indoor Use Based On Special Compreg Top. Can Be Fixed To Ground. 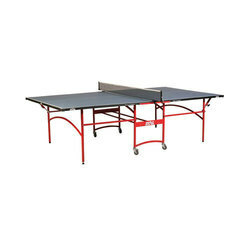 Outdoor Table Sigma Aluminium Single Folding. 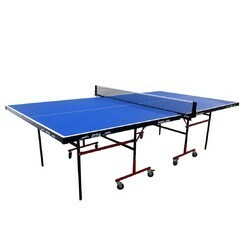 High Quality ALU Top, Resistance to, Dust, Rain, Moisture. Playing : To be use in Outdoor Weather Proof. 19mm thick top Mounted on 3/4inch x 3/4inch metallic legs and Frame having 50mm wheels & Levellers. 25mm thick (both side laminated) Top mounted on 1½inch x 1½inch legs 100mm wheels with brakes, Levellers and safety locks. Stylish and sleek with double locking device. 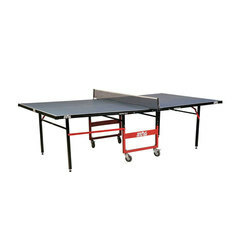 Easily assembled with minimum storage space & modern looks. CEN Certified. 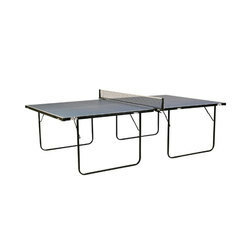 OUTDOOR TABLES with REVOLUTIONARY COMPREG TOP: The Compreg top is a construction of 11 layers of wood. Each layer is impregnated with special resin and compressed at very high pressure making it virtually unbreakable. 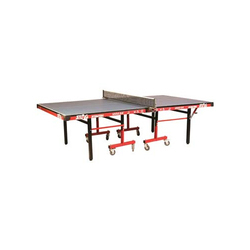 You can transport this table any number of times without any damage. 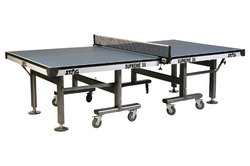 The Compreg material gives competition quality bounce because the surface is coated with special Dupont technologically advanced paint system. 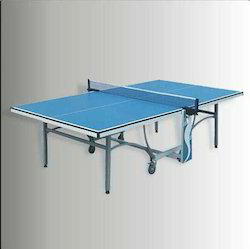 This is probably the world's 1st Outdoor table with bounce and other characteristics of an indoor top level table. All metal parts are galvanized and powder coated. 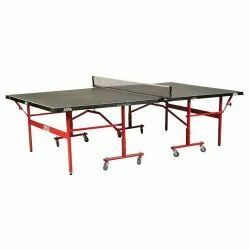 PACKAGE INCLUSION: 1 Stag Table, 1 Net Set & 1 Table Cover… FREE GIFTS: 1 Peter Karlsson Training DVD, 2 Stag Ninja Fire Racquets and 3 Stag Three Star Balls. PLAYBACK MODE: Play solo with Playback mode. 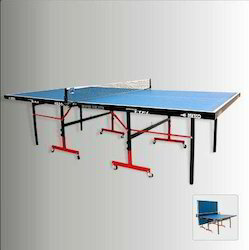 Just unfold one half of the Table and start training without a partener. DUPONT POLYURETHANE ANTIGLARE PAINT: Best quality paint which provides uniform and consistent bounce. 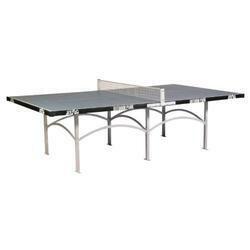 It also protects the surface and makes the table durable. 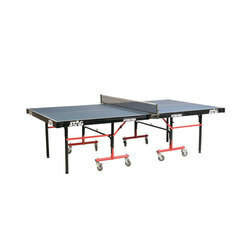 7 MINUTES ASSEMBLY TIME: This table can be easily installed in quick time. 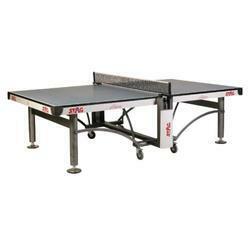 After the game just fold the table and store wherever you want. 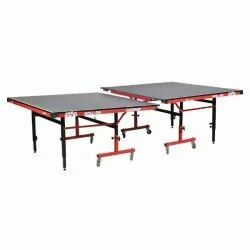 Foldable Indoor Use Table, Approx. 45 minutes to assemble the Table. Net Set Included. Square-tubular profile, 30 x 30 mm Undercarriage.4 wheels with the dimensions of 125 mm. All wheels are maneuverable. 15mm Fibre Board, blue coated. Semi Assembled, approx.15 minutes to be ready. Gross Weight : 70 kg. Net Weight : 60 kg. Net set Included. 15mm x 30mm Frame. Under Carriage : 20 x 30mm and 30 x 30mm. 8 wheels with the dimension of 50mm. For INDOOR use only. All wheels are maneuverable, 4 of the wheels has locking device. 19mm top (both side laminated) Mounted on 2inch x 1inch metal legs Frame having 75 mm wheels, Levellers and safety locks. No. 126 - Stag Outdoor Park A Strong And Sturdy Outdoor Table. Can Be Fixed To The Ground. No. 2010 - Stag PeteR Karlsson As Robust And Stylish As The Name Peter Karlsson. 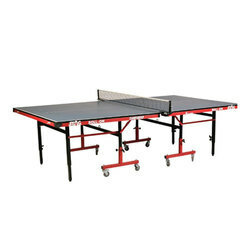 This Table With Exceptional Playing Qualities Is The Latest Addition To The Exhaustive Range Of Stag Table Tennis Tables. Suitable For High Level Competition And Also An Exclusive Piece For Any Playing Area.